were not disappointed whatsoever. Barak crafts 7 different wines, both red, white and rose. These wines are part of a distinguished lineup that awaited us after having visited this ‘garage operation’. His work all takes place in the backyard of his home where a traditional basket-press is still the main tool for his delightful undertaking in crafting his delicious wine. From the garage and barrel room, we enter his new tasting room inside his home where the air conditioning and cool white and rose wine is a welcoming treat for us under the warm Israeli sun. Barak is a friend and I make a point to visit him on my Carmel wine tours, not only on behalf of my guests, but also so I can pick up a few bottles for my own collection of this delicious, hand-crafted wine, some of my favorite in Israel. While the wine is not Kosher, I’ll have to wait until after Shabbat to enjoy this pleasure that I chose not to drink on the Jewish Sabbath, versus the rest of the week when I’ll partake most happily. We sample from the rose, chardonnay, and a mix of single varietal as well as blended reds. Somek never seems to disappoint and Barak is always a gracious host, sending us off is style to a lunch date at Tishbi winery, where I worked, running their visitor center upon returning to Israel 3 years ago. Our time at Tishbi was quite delicious as their restaurant is top notch and the wine tasting is only enhanced by the Valhrona chocolates that they import, complimenting the dark and bold red wines our guests enjoyed with the rich flavor of cacao. The tasting left us giddy and a little shikkur though your host made sure not to partake for the safety and security of our guests; well, just a tiny sip. Having worked at the winery, I know well the virtue of this wine and left the enjoyment to our guests who fulfilled their part by tasting, talking, and relishing the fruit of the vine. With the harvest beginning next week, your host will be splitting his time between the labor of love in the early mornings, picking grapes by hand, and the tours in the afternoons that brings our guests into the wineries, cellars, and vineyards across Israel. 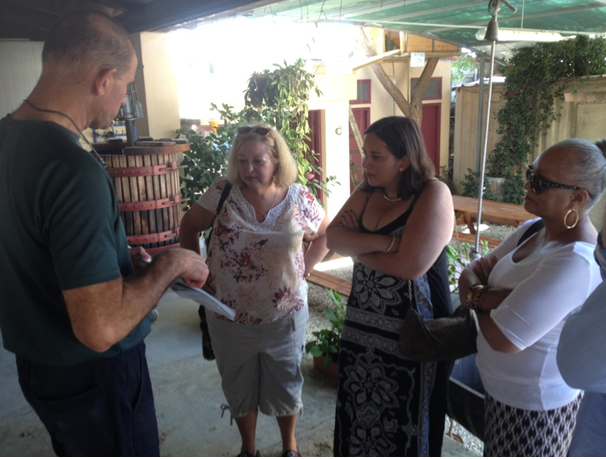 We hope you’ll join us for a tour and come enjoy a day of touring, tasting with us at My Israel Wine Tours.